Horizon 2020 or H2020 in short, the biggest EU Research and Innovation programme ever, started on 1 January 2014 with €78 billion of funding available during 2014 – 2020. 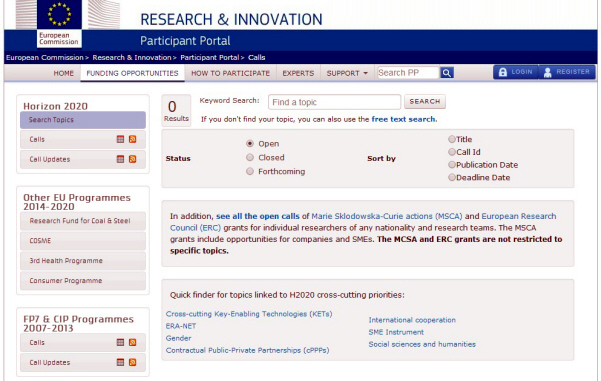 Visit the web site of H2020 at http://ec.europa.eu/programmes/horizon2020/ and learn about this programme that promises more scientific and technological breakthroughs, discoveries and new products by taking great ideas from the laboratory to the market. To help in organisation of training in different issues related to the preparation of proposals, participation in the projects, their management, reporting, accounting, etc. In addition to that, during 2013-2014 EuroTex was involved in promotion for Armenia of Associated status in H2020. The Executive Director of EuroTex R. Vardapetian was appointed by the Armenian Government as the negotiator with the EU's Directorate General for Research and Innovation. We expect that from 1 January 2015 Armenia will become a country, associated to H2020, under very attractive financial terms. Enter your search topic into the "Keyword Search" field and press the SEARCH button. In response, you may receive a list of Calls, - Open, Closed, of Forthcoming, depending on the selected Status. If you see something that matches your research interests, you are very much welcome to contact us for an advice, or to discuss how we can help you or even work together.